In 1942 America fell in love with Bambi. But now, that love-affair has turned sour. Behind the unassuming grace and majesty of America's whitetail deer is the laundry list of human health, social, and ecological problems that they cause. They destroy crops, threaten motorists, and spread Lyme disease all across the United States. In Deerland, Al Cambronne travels across the country, speaking to everybody from frustrated farmers, to camo-clad hunters, to humble deer-enthusiasts in order to get a better grasp of the whitetail situation. He discovers that the politics surrounding deer run surprisingly deep, with a burgeoning hunting infrastructure supported by state government and community businesses. 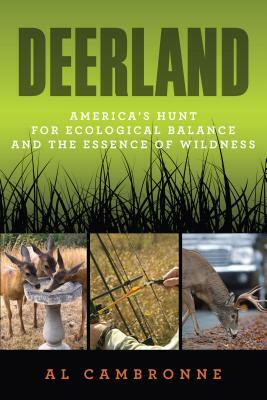 Cambronne examines our history with the whitetail, pinpoints where our ecological problems began, and outlines the environmental disasters we can expect if our deer population continues to go unchecked.With over 30 million whitetail in the US, Deerland is a timely and insightful look at the ecological destruction being wrecked by this innocent and adored species. Cambronne asks tough questions about our enviroment's future and makes the impact this invasion has on our own backyards. Al Cambronne is a freelance writer and photographer . He is the coauthor of Gut It, Cut It, Cook It. He is well-connected with leaders among the nature, outdoors, conservation, and foodie crowd. He is a graduate of the University of Wisconsin-River Falls.